Прием заявок на летнюю школу "CREATIVE AND SOCIAL PRACTICES IN PUBLIC SPACES"
Creative Association of Curators TOK is pleased to invite young Russian and international artists, curators and art producers interested in creating projects in the public realm to participate in our summer school ‘Creative and social practices in public spaces’ that will take place in St Petersburg from July 21 to July 27. The summer school represents an interactive platform for experience exchange, producing new knowledge and discussing the cutting-edge artistic and curatorial practices related to public spaces. At the series of lectures and workshops conducted by Russian and international artists and curators participants will examine socially-engaged and community-based art practices as well as artistic research methods. One of the school aims is to create a professional network for potential collaborations, therefore a particular emphasis of the program is put on meeting local artists and curators and exploring the cultural context of St Petersburg. While in St Petersburg the school participants will also have a chance to attend the European Biennial of contemporary art Manifesta 10 and meet some of the organizers. TOK also sees the school as a think tank where knowledge and expertise of the school participants could be applied to a particular local context. The school will be organized as a part of TOK’s ongoing public art project ‘Critical Mass’ and around the upcoming ‘Critical Mass’ exhibition, which is planned for summer 2015. 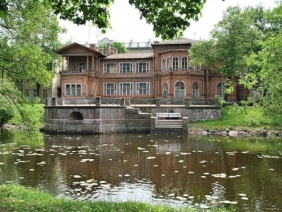 The school will be incorporated into a series of preparatory events that aim to warm up a new location of ‘Critical Mass’, an old wooden 19th century mansion the Gromov’s Datcha, that had been neglected for decades but is now planned to be turned into a community cultural center. Together with members of local community, artists, designers, architects and social scientists TOK will work on revitalization of the Gromov’s Datcha, which in the 19th centuries was one of the hot spots of the summer cultural and social life. By analyzing the past and recent of the Gromov’s Datcha participants of the summer school will be involved into development of new knowledge about this unique location. Together we will try to create strategies for bringing the building into life and incorporate it into the social and cultural landscape of the neighborhood. Russian and international artists, curators and art producers with strong interest in artistic/curatorial practices in public spaces are encouraged to apply. Previous experience of doing projects in the public spaces is preferred but not necessary. 10-12 participants will be selected to take part in the school. Participants outside St Petersburg will be provided with accommodation (large shared flat in the center of St Petersburg)t. Transportation expenses will be covered for 1 participant from Ukraine, 1 from Moldova and 1 Russian participant outside St Petersburg. International participants will be provided with an invitation to apply for the Russian visa (visa costs are covered by TOK). By the end of the project TOK will release a publication on art in public spaces in Russian and English. The publication will focus on successful and sustainable art projects in the public sphere and will include theoretical texts, case descriptions and interviews. TOK’s summer school participants are encouraged to submit texts for the publication. Participation in the school is free of charge for all participants.